We watched many videos about it. And … not all helped. Why? Because some People forgot to tell us How exactly improve Views and Visitors. But … how to make ‘it’ and ‘what’? Maybe CE will help You 😉 . Before You start … Think – What exactly You want to have and want to Show! And don’t worry if Your YouTube account username is … simple word, name or last username. It’s not important at all. If You will make new account with brand new name – it won’t improve Your views. Just leave it. But if Your account was ‘limited’ several times – better create new one. Don’t be shy. Make video about Your self. Make a video about Your Personality and / or What You Done. Don’t: clown, mess, shout, piss off with Your ‘unreal’ emotions. Add most important information about You self : name (nickname), website link, location, tell about Your activities and so on. Make viewer ‘Want Look at You’. Did something interesting happened in Your Life? Show it! Is Your hobby make pictures, make videos or collect something? Show What You Got! And if Your account is enabled for uploads longer than 15 minutes – You can make good ‘mini film’. If You were where is very nice, unusual, high and so on – make a video. Show it! If You got any pets – video about them can attract much attention. 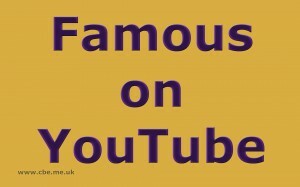 If You like any VIP person, musician an actor (…) – can make a video about Them. This video advertise My LivePage Social Network. If You got something Funny – Share. If You want to improve Your channel views – make some videos in Other languages. The same video just in Russian Language. Make sure You use right soundtracks for Your videos. Another way YouTube will block Your video. After You make and upload Your videos – don’t forget to advertise about a bit. Add some links on Facebook (or another Social Network), Your website, send links to Your Friends. Got it – Show it!